The International football pitch is shown in the diagram with dimensional details (click to enlarge). FA International matches: 100 to 110 metres in length by between 45 and 90 metres wide, so the variation in width can vary considerably. The pitch must be rectangular in shape so that the length must in all cases exceed the width. There is a recommended 9 metre end margin, and a 6 metre side margin. For 100m x 64m playing area, an area of 118 metres by 76 metres would be required. This entry was posted on Monday, March 17th, 2008 at 21:42 and is filed under Design Data, Ergonomics. You can follow any responses to this entry through the RSS 2.0 feed. You can skip to the end and leave a response. Pinging is currently not allowed. 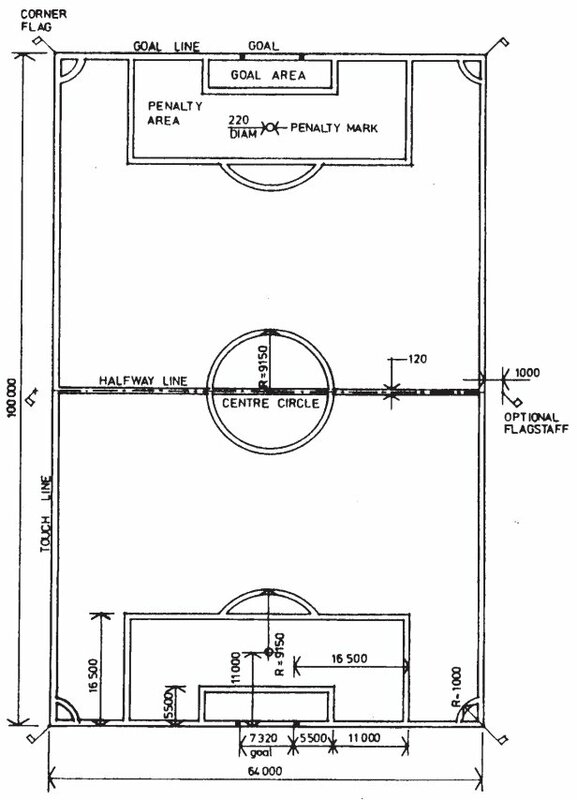 the dimensions of the penalty area, central circle can also be published and also the dimensions of an ideal football.